During her working visit to Israel, Prime Minister Viorica Dăncilă had today, January 18, 2019, a meeting with the Prime Minister of the State of Israel Benjamin Netanyahu. The senior officials hailed the excellent relations existing between the two countries, a fact also reflected in the frequency of high –level bilateral contacts. In this respect, they also discussed about holding the joint meeting of the two Governments in the first half of this year. 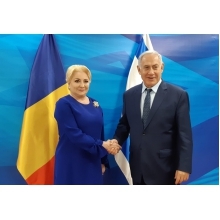 Prime Minister Viorica Dăncilă reconfirmed Romania’s interest in strengthening and deepening relations with the State of Israel in the fields of strategic cooperation, cyber and energy security, medicine, research and innovation. The two Prime Ministers also voiced satisfaction over the advancement of negotiations for the conclusion of Romania –Israel Partnership in the field of new technologies, likely to stimulate the mutual interest of the two countries’ business communities, so that the bilateral economic potential be turned to good account. The importance of strengthening relations in fields such as: healthcare, tourism and education was also highlighted on this occasion . Moreover, possible ways of cooperation between Romania and Israel, including from the perspective of our country’s holding the Presidency of the Council of the European Union were also discussed. At the same time, the two Prime Ministers exchanged views on aspects pertaining to the current international situation.